This comprehensive MSc brings you to the forefront of research in theoretical physics. The programme has a focus on the study of Quantum Field Theory and is taught by academic staff at Queen Mary including leading string theorists from the University’s Centre for Research into String Theory. You will develop expertise in advanced mathematical techniques and their applications in theoretical physics. Modules cover topics including Supersymmetric Field Theories, String Theory and Quantum Field Theory. The programme includes a one-term long specialist project, which you will complete under the supervision of an academic with research interests in a similar area to your own. The project is an independent piece of research that goes beyond the immediate scope of the curriculum and is the best possible preparation for PhD style learning. The programme is designed to give you a complete specialist overview of key topics in theoretical physics as a preparation for study PhD. Our theoretical physics researchers work closely with leading research groups around the world and we have a track record in preparing students for PhD places at these institutions. The high level of mathematics covered in the course will also prepare you for a career in a range of other industries where these skills are in high demand, such as finance. Ranked joint first in London for research outputs (REF 2014), the School of Physics and Astronomy has an international reputation for its research across areas such as particle physics, materials physics, string theory and astronomy. As a student of the University of London you will have access to modules taught at UCL and King’s College London and Royal Holloway, University of London. Students with an existing Transport for London travelcard will normally be able to reach these institutions at no extra cost. Broaden your academic horizons by taking part in regular academic meetings, colloquia and seminars with exciting speakers from renowned institutions. An MSc office and open breakout spaces provide a range of opportunities for you to work, meet or discuss ideas with others. Each research group has its own breakout space and kitchen facilities, while staff and students from across the School regularly make use of the School’s larger social and study space. Facilities include a fully resourced library, IT labs, social and sports facilities. The new graduate centre provides excellent teaching and study spaces for use by postgraduate students. The MSc in Theoretical Physics is available to study full-time over one year. The programme consists of eight taught and examined modules during the first two semesters and a substantial research project undertaken in the second and third semesters. Students will take 120 credits of taught modules and a 60 credit research project. You will also be able to take physics modules from University College London, King's College London or Royal Holloway University of London at the programme director's discretion. To find out more, please visit the School of Physics and Astronomy website. This programme requires ATAS clearance. Students who are not EEA or Swiss nationals may require ATAS clearance to undertake this course. The CAH3 code for this course is CAH07-01-01. Further information on ATAS can be found on our Advice and Counselling webpages. 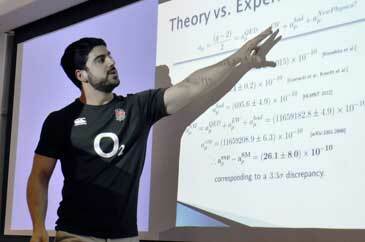 We expect students to have at least an upper second class degree in Physics or closely related discipline; in exceptional circumstances students may be admitted with a lower second class degree. Non-native English speaking applicants would have to achieve at least 6.5 IELTS score and the equivalent in the relevant TOEFL assessment. Students from outside of the UK help form a global community here at Queen Mary. For detailed country specific entry requirements please visit the International section of our website. If your first language is not English, you must provide evidence of your English language proficiency. Find out more about our English language entry requirements. If you do not meet language or scholarly requirements it might be possible for you to undertake foundation or pre-sessional programmes that will prepare you for the masters programme. For more information, please contact the Admissions Office. The majority of the MSc is delivered through lectures. As a member of a small student cohort you will also have ample access to the academic staff responsible for delivering the lecture courses during their scheduled office hours. You will have 3 hours of lectures per module and normally four taught modeuls per semester. You will also be expected to undertake a large amount of personal study, reading widely around your subject. Additional support is provided by your allocated academic adviser and the supervisor for your research project. The majority of taught modules are assessed by a final examination (typically 90% of the final mark) and by coursework (typically 10% of the final mark), although individual module mark schemes may vary from this. The compulsory MSc project is assessed by the final written report (60% of the final mark), a student presentation and oral examination (30% of the final mark) and performance during the project (10% of the final mark). You will also be assessed on a research project (as above). There are a number of sources of funding available for Masters students. These include a significant package of competitive Queen Mary University of London (QMUL) bursaries and scholarships in a range of subject areas, as well as external sources of funding. We offer a range of bursaries and scholarships for Masters students including competitive scholarships, bursaries and awards, some of which are for applicants studying specific subjects. Find out more about QMUL bursaries and scholarships. Home/EU students can apply for a range of other funding, such as Professional and Career Development Loans, and Employer Sponsorship, depending on their circumstances and the specific programme of study. Overseas students may be eligible to apply for a range of external scholarships and we also provide information about relevant funding providers in your home country on our country web pages. Download our Postgraduate Funding Guide for detailed information about postgraduate funding options for Home/EU students. Read more about alternative sources of funding for Home/EU students and for Overseas students. We offer one to one specialist support on all financial and welfare issues through our Advice and Counselling Service, which you can access as soon as you have applied for a place at Queen Mary. Postgraduates from the Queen Mary School of Physics and Astronomy go on to work in a variety of careers, such as risk analysis, science communication and academia, whilst others pursue their interest in physics and astronomy by undertaking a PhD. The national 2011 destination survey confirmed that 91% of the graduates on this programme were in employment and/or study six months after graduation and all were working/studying at graduate level. Queen Mary postgraduates have an average earning power of £35, 410 six months after graduation. Throughout the programme postgraduates have access to careers support to prepare them for applying for work after graduation. Recent career events for the School’s postgraduates include workshops on applying for and doing a PhD, and how to pursue your career aspirations. Queen Mary’s location between Canary Wharf, the City and the Olympic Village redevelopment means that there are substantial opportunities for on campus and local part time work during their postgraduate degree. On campus there are 1200 job and volunteer opportunities ranging from E-learning Assistant to Website Administrator and from Society President to Student Mentor. QTemps job agency offers work suitable for current students and recent graduates, QMSU Volunteering facilitates volunteering and QM JobOnline hosts over 800 part time and full time job vacancies. Read more about our careers programmes and range of work experience opportunities on the Queen Mary Careers pages. After completing an Astrophysics BSc at QMUL, the Euromasters MSc at the same institution seemed like an obvious option. I liked the department and after working on my BSc dissertation in the theoretical physics department, I knew I would gain a lot from completing the year-long MSc project there. The fact that it was a two year course with a whole year dedicated to research was also an attraction. I wanted to undertake a PhD and felt that the experience of the research project as part of the MSc would be a good stepping stone to be able to achieve that. I appreciated the taught year of the MSc program and benefitted from the choice of intercollegiate studies, allowing me to pick modules at King's college, UCL and Royal Holloway. This made a huge difference as it widened my options and allowed to experience different institutions. I am now in the second year of my PhD in theoretical physics at the University of Liverpool. There is no doubt that the MSc at QMUL fully prepared me for project research and helped me to realise that a PhD was definitely what I wanted to do for my next step. The official, independent guide for anyone considering a taught postgraduate course.